This year, 8 teams took part in the NACBAIT Youth 15 & Under division. This level of participation was an encouraging sign that the tournament’s future appears to be in good hands. On the courts, the zealous play and youthful excitement of these boys transcended anything that could have been expected. Following Saturday’s pool play, the top 4 teams advanced to the Medal Round, while the remaining 4 teams battled it out in the Consolation. Emerging as Consolation Champions were the Toronto CCYAA 15’s, as they somehow snatched a victory over the spirited NY Falcons 22-21. Jarrett Lee paced NY with 10 points, while Derek Hui had 2 trifectas and Ivan Ho had 4 points and 7 rebounds for Toronto. In the Medal Round, the defending champion NY USAB 15’s looked to be in trouble as a career first half from Markham FCCM’s Edmond Lee (15 pts, 4-4 FT, 2 steals) threatened NY’s reign. In the second half, USAB pulled out all the stops and went to a box and one, as they started to pull away. As the game wore on, the USAB bench pushed them to a 45-28 win. 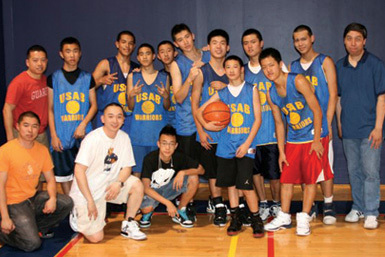 USAB was led by Devin Figueroa’s 21 points and 6 boards, while Greg Hsu threw in two treyballs on his way to 10 points. The second Semifinal was a real dandy as the upstart Maryland Pistons squared off with the 2007 runners-up, the NY New Life Rockits. Both teams began the game with solid defenses and not so solid offenses, as it was knotted 10-10 at the half. In the second half, things started to open up a bit, which clearly favored the uptempo Maryland Pistons. Piston guard Victor Wu got his rhythm going after the break as he tallied 10 second half points and had 2 big swipes. Just as it looked like Maryland was going to move on with ease, the Rockits decided that they weren’t about to throw in the towel just yet. Derek Kwong scored 6 points and snared 4 rebounds, while Mike Pang and Ray Fung each tossed in 5 points to make it a game again. However, after Kenny Yu (11 pts, 2-2 ft, 2 rips) fouled out, the Pistons were able to escape with a win 32-28. The Finals appeared to be shaping up like a track meet in the making as both teams love to get out on the break off of forced turnovers. These two teams had met the day before in pool play, with USAB edging out Maryland 33-31. This time around, USAB was a little more ready at the tip. They took an early 10 point lead with a real team effort at both ends of the court, as 9 of their 10 players made their mark in the scoring column. After leading 23-12 midway through, NY held on for a 48-40 title win. MVP was Devin Figueroa as he chipped in 11 points, 4 assists, and 3 steals.